Shopping for Video Games Pop! Vinyl Figures? Pop! goes Sweet Tooth! The most iconic face from the demolition derby game Twisted Metal comes to Pop! Vinyl form! A psychotic murderous monster that hides behind a vicious clown mask, Sweet Tooth features his head of flaming hair and mischievous grin. 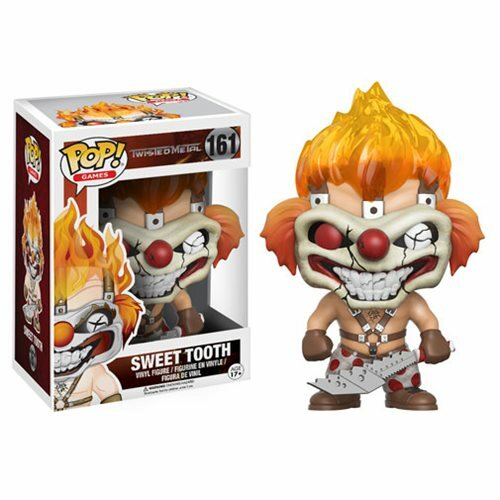 The Twisted Metal Sweet Tooth Pop! Vinyl Figure measures approximately 3 3/4-inches tall and comes packaged in a window display box. Add Sweet Tooth to your collection and get ready for mayhem! Ages 17 and up.